The difficulty of Dark Souls puts its speedruns almost in a different category than your typical video game speedrun. It’s more shocking to watch someone race through a game that you smashed your head against for 60 hours than it is a game you galloped through in half of that. The Souls games — Sekiro: Shadows Die Twice and Bloodborne included — are designed to have points, usually bosses, that stifle your progress and teach you something completely new. Sometimes that’s how to properly block and other times that’s how to manage multiple enemies at once. The games are notorious for their boss-shaped roadblocks which cause players to complain when they can’t make progress and cheer each other on when they can. So when you see an experienced player kill one of these bosses in a fraction of the usual time — by a character who’s also low-level and woefully under-equipped — it’s almost maddening. But like any speedrun, the gamer has probably spent hundreds of hours toiling away at the various strategies, skips, and routes to minimize delays and maximize speed. Sekiro: Shadows Die Twice only recently came out and the small speedrunning community on Twitch is still breaking apart the game. Currently, there are already a few bosses that are entirely skippable, and some sections of the game that are trivialized with clever movement and item usage. The runners use Cheat Engine tables to give themselves unlimited health and stream repeated tests of new methods to get through the game faster than the developer intended. 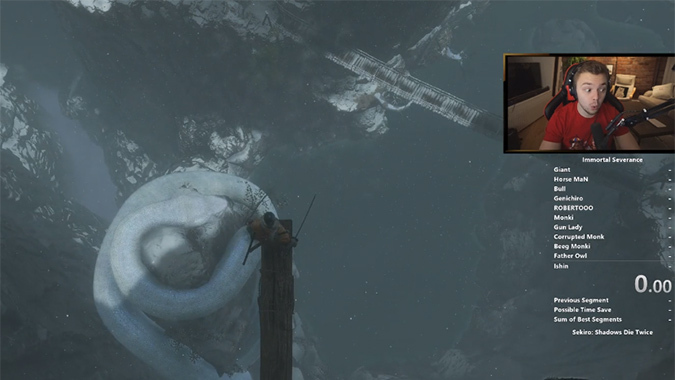 I watched one streamer spend an hour jumping to his death while trying to hit an invisible world trigger that would spawn a giant snake that would save a minute or so. Because we’re still in the early stage, many runners take the time to test new skips and alternate methods before trying to best their own times in the current popular route through the game. Warning: the following clip has some NSFW language. It’s fascinating to see a game that’s so skill- and movement-based, labyrinthine, and lengthy be cut down into bite-sized chunks. Currently, one of the fastest speedrunners has the game down to 33 minutes — and that’s one of three categories to run the game in. Other categories include the game’s different endings. I’m sure at some point there will be a new technique found that will cut that time down significantly more. I’d recommend watching Ellajaz, SayviTV, and Distortion2 to see if that happens.